← Now this is some serious Satellite Uplink training! In the past few months, I’ve made several business trips to Los Angeles. Invariably, these trips require renting a car, and I have been lucky to have been upgraded to either a 2013 GMC Acadia or its closely related sibling the Chevrolet Traverse. Both vehicles are made by General Motors, and offer HD Radio with Artist Experience as a standard feature. Needless to say, I have always taken interest in new radio receiver technology, and these days my work with Clear Channel Media + Entertainment has me involved with it more than ever. That being said, it’s nice to finally see a product or feature the industry has been waiting for actually realized in a final product. What’s more, since GM is offering these as a standard feature in 2013 and presumably future models of this vehicle, obtaining one of these for evaluation or purchase is now easier than ever. While I have seen this receiver before on the demonstration floors at the Las Vegas Convention Center during CES and NAB, it’s one thing to have a few minutes in the car at a trade show compared to driving the vehicle for a few weeks. 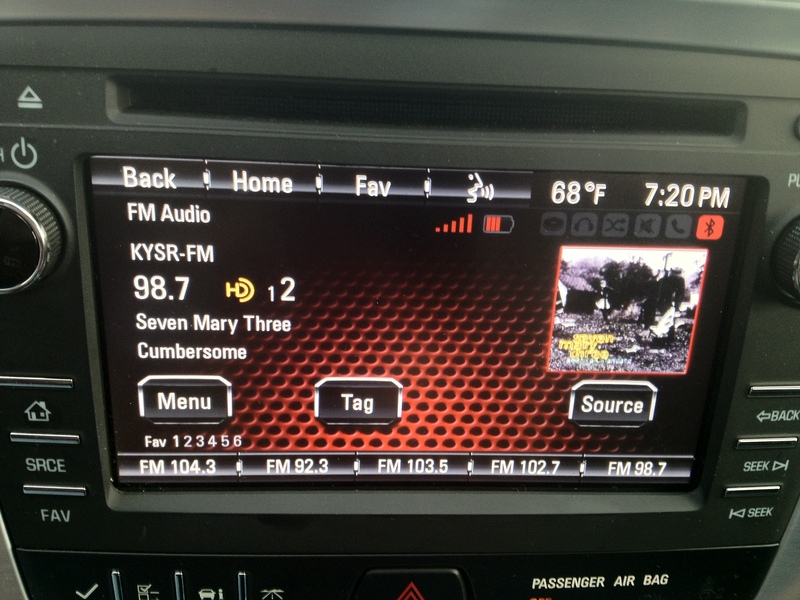 Album Art as seen on a 2013 GMC Acadia. Photo by Alan Jurison. As an added bonus, for those stations that are not HD, GM has a very good implementation of RDS features with PS and RadioText (RT) support on analog-only FM stations. A feature I would like to see GM to consider in the future is adding RadioText+ (RT+) to allow for analog-only FM broadcasts with RDS to provide a very similar “look and feel” on the display to put it near par with HD stations using PSD. Focusing directly on the HD implementation of the radio, GM has done a fantastic job. I’ve found in my cursory driving the blending to analog and digital is graceful. The performance of the audio on HD stations, MPS (HD1) and SPS (HD2, HD3, etc) stations all works great. The AM side sounds good too. LA has several stations that provide AM HD, and it’s a real pleasure driving around the market blending into AM HD. And in a few rough spots under bridges downtown, I found when the radio blended to analog on some of the 5kW AM HD stations in the market, I couldn’t wait for digital coverage to resume. But the real hero of the day is that GM has a very solid implementation of Artist Experience (album art) via HD with this radio. I noticed no issues with the implementation. It also offers full station logo support. I think the trickiest part is to stay on an HD station long enough to initially acquire the station logo. Of the three rentals I’ve had, one was very low mileage and did not have any of the LA station logos acquired. I had to resist the urge to go channel surfing on stations I know are transmitting station logo in the market and wait until the logo was acquired. That’s because the station logo is often sent very infrequently to conserve bandwidth for other HD services. The typical/default configuration from iBiquity is a send of one station logo image per channel per every fifteen minutes. This requires you to stay on the HD1 or HD2 (etc) of a specific station for that time period for acquisition of the logo. The idea behind that is that this is something that, once acquired, will not change frequently, and also will be stored in permanent memory of the receiver. For your core listeners, this condition will not be difficult to satisfy. GM does a great job with the permanent storage. Between driving sessions (morning and evening) it retained all the station logos I had acquired all week. Subsequent rentals with higher mileage on the vehicle had most of the station logos available in the market acquired. With the station logos acquired, the receiver seamlessly goes from an album art image for a song, to the station logo, and into the next song’s album art image. GM’s implementation of Artist Experience and Station Logo has been perfect under my observations in the past few weeks. Better yet, it puts a very nice graphical face to radio – and offers a comparable experience to when the system plays songs off your iPhone or iPod with album art. It really puts a nice face to radio. Perhaps most concerning is that as of my last check (mid June 2013) only seven stations in the Los Angeles area were transmitting Artist Experience via HD. Of these seven, six of them belong to my employer, Clear Channel. You may have heard iBiquity and others indicating automotive receivers that support HD and Artist Experience are coming, well, they are out there. GM offers it in select models now as standard, and the list of other OEM’s out there with HD and Artist Experience in vehicles is growing rapidly. Stations that do not have this technology implemented are at a serious disadvantage. My employer, Clear Channel Media + Entertainment and I have been a very active proponent in providing the industry with suggestive tips on how to implement this technology. At the NAB Show in April 2013, I presented on this topic, and I also wrote an in-depth white paper on the implementation of this technology in the NAB Broadcast Engineering Proceedings (available from purchase from the NAB). I’m pleased to be partnering with the Society of Broadcast Engineers (SBE) to provide an in-depth, live, interactive webinar on this topic on Thursday, September 12, 2013 at 2pm Eastern. Registration details are available (here). This presentation will be at least an hour in length, and talk about implementing Artist Experience via HD in three parts. First, what types of receivers are out there that support this technology today. I will provide some pictures of various units and speak about their implementations. The second part of the presentation will focus on the technical details of how Artist Experience works. And finally, I will discuss implementation strategies of Artist Experience to help you relate the theory behind the technology into reality. This will draw on the experience that we have collectively learned at Clear Channel as we rapidly implemented Artist Experience via HD Radio nationwide in 2012. Alan Jurison is a senior operations engineer for Clear Channel Media + Entertainment’s Engineering and Systems Integration Group. He holds several SBE certifications including CSRE, CBNE, AMD and DRB. His opinions are not necessarily those of Clear Channel or The Society of Broadcast Engineers.